Update: In the meantime, Microsoft has officially released Office 2016, which replaced the 2013 edition. Microsoft Office is world’s most popular productivity software suite. On the other side, Microsoft’s Windows is the most used operating system for PCs. In this post, we’ll explain what options are available when it comes to Office use under the latest version of OS – Windows 10. Besides the old-school Microsoft Office suites, free Office Online web service, and free open source replacements for Office, in Windows 10 users now have a new option – touch-optimized “Universal” Office apps. Best suited for classic laptop and desktop PCs with Windows 10 and previous OS iterations is the current Office 2013 edition. This keyboard-and-mouse-centric “desktop” version is available as a one-time-purchase package, such as for instance Office 2013 Home & Student edition ($139) or as a suite delivered via Office 365 subscription service (starting at $6.99 per month). 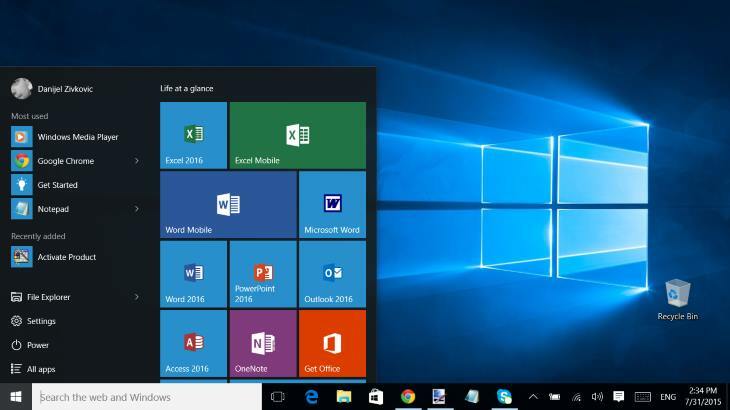 In both cases, Office 2013 is fully compatible with Windows 10. We have tried it out and found no problems so far. 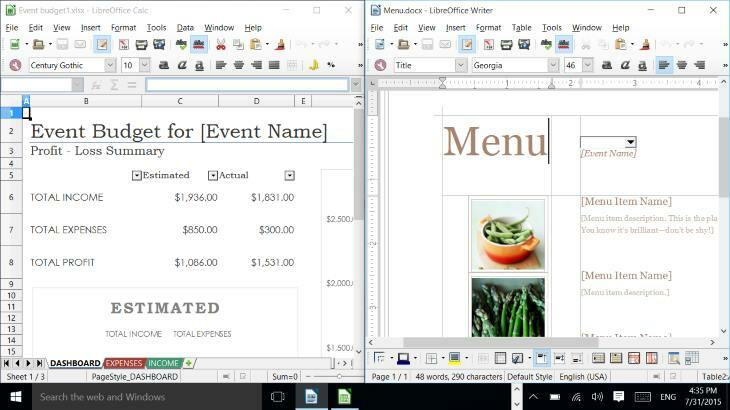 As a side note, although Office 2013 is keyboard/mouse-oriented, it can be made more touch-friendly by increasing spaces between menu items and other elements of programs’ user interfaces. If you haven’t purchased any of these yet and you want to, it’s worth mentioning some of the differences between the Office 2013 “buy” and “rent” options. As already mentioned, if you buy it you’ll be charged only once at the time of the purchase, but then you’re stuck with the current version of the suite until you buy the new one. With Office 2013 delivered via 365 service, you “rent” it for a monthly fee. Once a new version of software gets released your edition can be automatically upgraded to it without additional fees. Furthermore, it’s important to note that Office 365 (Personal and Home) packages include a robust set of applications, including Word, Excel, PowerPoint, Outlook, OneNote, Publisher, and Access. On the other side, the classic Home & Student 2013 edition lacks Outlook, Publisher and Access programs. Furthermore, even the most basic Office 365 subscription allows you to install software on multiple devices – on up to 1 PC or Mac, 1 tablet, and 1 smartphone. The standard Office Home & Student can be installed on only 1 PC. Both options are available via Microsoft’s official store. 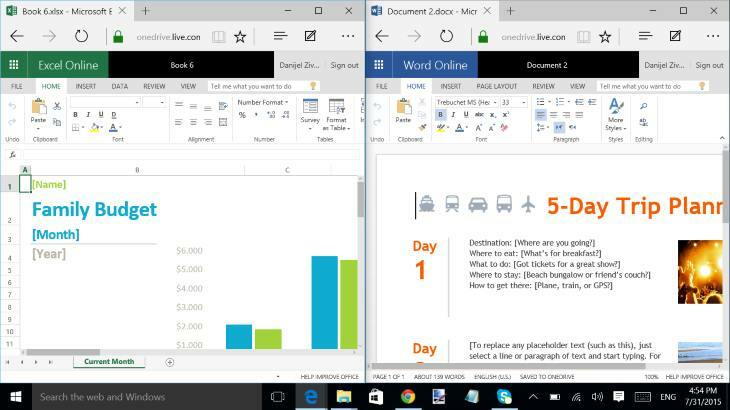 Microsoft has recently launched a new set of Office apps. Following the trends in the PC industry, new Word, Excel, PowerPoint, and OneNote apps available on Windows Store have touch-friendly interfaces. That’s the main difference of these Windows 10-specific “Universal” apps over the old-school keyboard/mouse Office versions. Nevertheless, you can use the apps even if you don’t have a touchscreen computer, by working with a keyboard and mouse/trackpad. 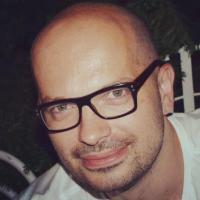 On the negative side, Microsoft has removed some functionalities which are present in the “full” versions of the apps, in order to make document creation and editing more straightforward and simpler. If you have a laptop, 2-in-1, tablet, or any other kind of PC running Windows 10 and want to install these apps, just hit the Windows Store and search for Word, Excel, or PowerPoint. OneNote is by-default pre-installed on Win 10 systems. On devices with display sizes above 10.1″, the apps are listed in the Store with “Mobile” suffix, except OneNote. If you access the Store on a Windows 10 device with a screen of 10.1″ or smaller, the apps are simply listed as Word, Excel, PowerPoint… Except the names, the apps are the same. Screen size matters in one more important way. If you’re using a 10.1″ or smaller device, the apps are free to use with full editing functionality enabled. 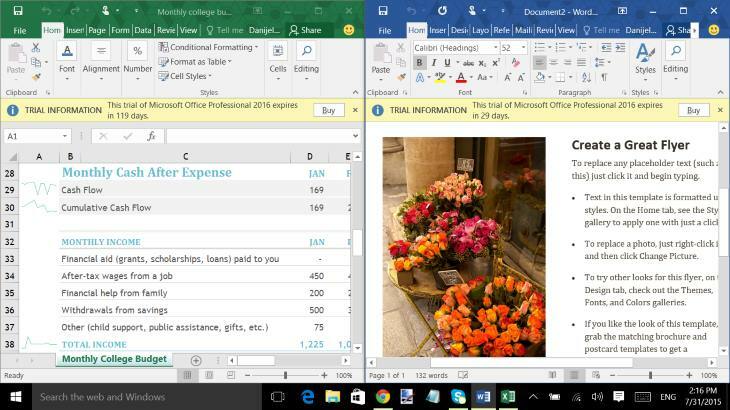 If you have a larger-screen PC, unrestricted use of “Mobile” Office apps requires an active Office 365 subscription. Otherwise, you can use the apps for document viewing, but not for creation and editing. 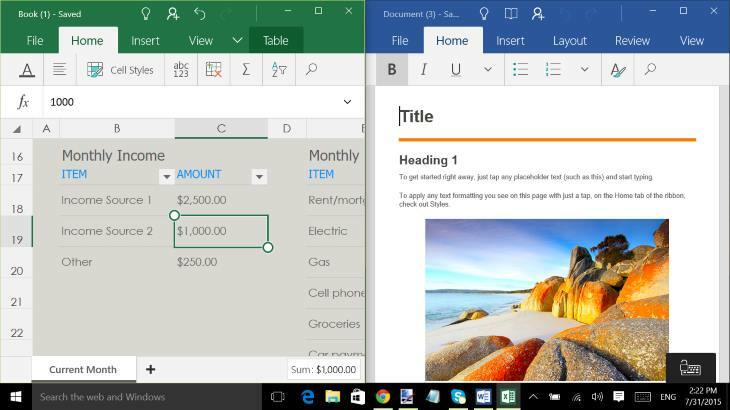 Microsoft is currently working on Office 2016, successor of Office 2013. Although it isn’t a finished product yet, you can use it as a preview (“beta”) software. 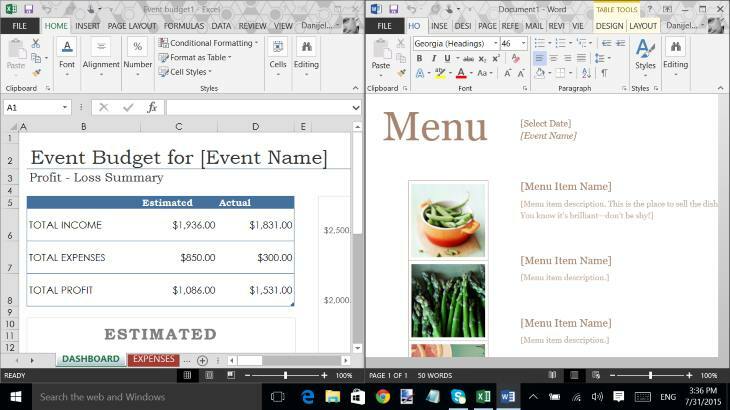 Office 2016 Preview is free of charge and will remain free until the final release. It’s scheduled for September 2015. You can download it now as a standalone installation from Microsoft’s website. Also, you can upgrade your Office 2013 to 2016 Preview if you use the older version as a part of Office 365 pay-per-month service. Out of curiosity, we have installed under Windows 10 an almost 15-year old Microsoft Office – the XP Professional Edition. Although it doesn’t sport newer features such as tight integration with Microsoft’s OneDrive cloud storage service or advanced collaboration functionalities, Office XP Pro works just fine under Windows 10. So, if you still want use an old suite, chances are it will work under Windows 10 as good as under Windows 7, 8.1, or other old Windows versions. A problem might be differences between old Office file formats, such as the old Word’s .doc as opposed to newer .docx. Opening older files in newer Office programs might need converting and produce improper formatting of documents. Even worse, you won’t be able to open a .docx file in XP Pro’s Word at all. The same applies to other Office applications. 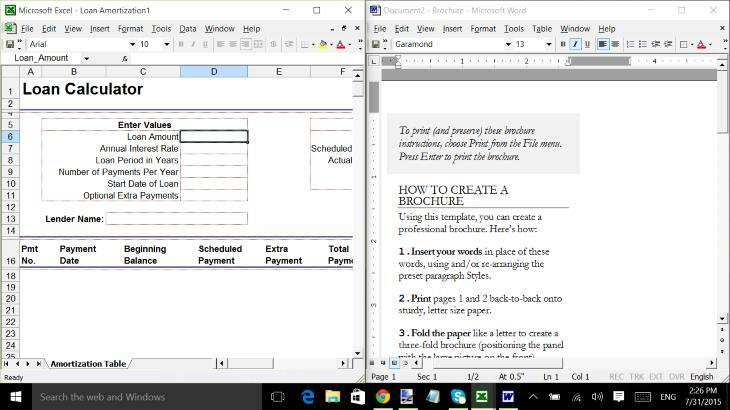 There’s another Microsoft Office version – Office Online. It’s web-based. The most popular applications – Word, Excel, PowerPoint, Outlook, and OneNote are completely free. After a single login to http://home.office.com using any modern web browser, users can create, edit, and view Word, Excel, and PowerPoint documents, work in OneNote, or check emails via online Outlook version. True, there are some limitations, since the Online apps can’t work without Internet connection and lack some functionalities of their “offline” siblings. Also, working with user interfaces through a web browser isn’t as smooth as with locally installed programs. If you’re OK with doing your office work online, you can also use Google’s counterpart called Google Docs. If you however want a completely free “offline” productivity solution, you can try some of the available open source-based suites. On our Windows 10 test laptop, we have easily managed to install and run two most popular free productivity suites – LibreOffice and Apache OpenOffice. These keyboard-and-mouse-optimized software suites can be used for word processing, work with spreadsheets, presentations, databases, and other productivity tasks. Their applications are mostly compatible with Microsoft Office document formats, so chances are you’ll be able to edit your Word, Excel, and other documents using the open source replacement programs without problems. The Office Open XML Compatibility Pack allows Microsoft Office XP SP3—and even Office 2000 SP3—to create, edit, open, and save DOCX files and other Office Open XML files (e.g., PPTX). Hi. I have a 10 inch 2-in-1 laptop. Currently i am using Word Mobile and etc. My one month free trial will expires soon. Do you have any suggestion for me to replace them? I does not want to buy them. I need to use a lots of office apps as i am a student. I am looking forward for your reply. Thanks. Have you tried to right-click on your document file and then select “Open with” option from the menu and select LibreOffice there? I have a new Surface Pro 4 with Windows 10, but Libre Office does nbt work. I have a blank black screen with I access the program. Is there a driver I need to make it work?